You can access reports for a particular campaign directly from the Campaign Editor in your Flipcause Dashboard, by going to Campaigns > pick your campaign by browsing or searching and click Edit This Campaign > Campaign Reporting. In Transaction & Activity Reports, Transaction Date is also a required filter, but you have several options on how to pick your desired date range(s). 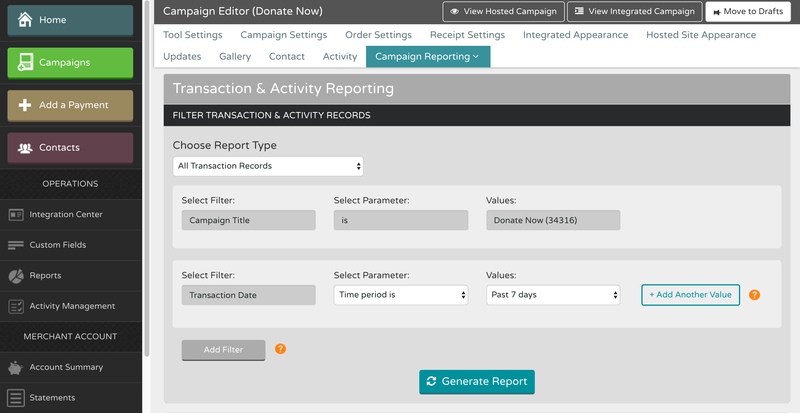 The ability to run campaign-specific reports directly from the Campaign Editor means that as a super-admin, you can grant sub-admins access to only their campaigns, and they can still run their own reports without needing access to the global Reports area of your Flipcause account.